Lucius Julius Aurelius Septimius Vaballathus Athenodorus was king of the Palmyrene Empire centered at Palmyra, Syria, who came to power as a child, ruling with his regent, his mother Queen Zenobia. 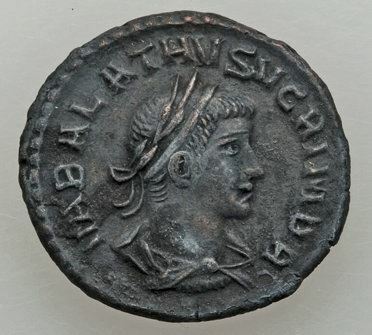 Initially the Roman Emperor Aurelian recognized Vaballathus' rule, and early coins issued by Zenobia under Vaballathus's name, also acknowledge Aurelian as emperor. Zenobia, however, soon declared an open rebellion and conquered most the the eastern provinces. The recently independent Palmyra lasted for three years, until the Romans took action, and conquered all Palmyrene land. After losing the Siege of Palmyra, Zenobia and Vabalathus were taken as hostages to Aurelian in Rome.